Okay! Musume Time: Cruel's Future Fantasy is Here - Are you Ready for it? Cruel's Future Fantasy is Here - Are you Ready for it? As with all my reviews an articles, all thoughts and opinions included in this post are my own and no one else's, unless otherwise stated. These are my opinions, and whilst you may not agree with them, it does not mean I can not have them. We have our own thoughts that we as individuals are entitled to, so please respect that, and I will respect you in return. Thank you. I know that not a lot of my readers are fans of Beckii Cruel, in fact I am pretty sure some of you are wondering just why I am even writing about her on my blog. Simple; she is an Idol, and this is an Idol blog. I write about songs and videos that I enjoy, and also about videos and songs that I don't like, and I will sometimes even tackle essay-based posts on topics that interest me greatly. The lesser-known or lesser-talked about Idols and groups the better, if you ask me, though in the case of Miss Cruel, being a lesser-known Idol on the Wota-net is pretty much impossible. In both good and bad ways, Beckii Cruel has attention trained on her, especially with her new Japanese-comeback single, Future Fantasy. Again, you are probably wondering why I am taking such a strong focus on Beckii Cruel now, what with my writing a Review on her documentary that she released alongside her new single PV, and now taking a look at her PV, and to be honest, I also wondered why, but in the end I realised that Beckii Cruel, like many other Idols I have found and written about, has caught my interest. 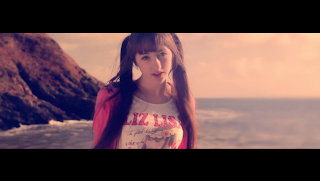 The only thing that sets her apart from other Idols that I write about is that she is British, and is also returning to the Idol scene after a three-year break from the Japanese music scene. That, and she is also self-produced now, which is actually pretty cool. Also... I am really digging her new song, Future Fantasy. Whine all you will, and hate me with all your might, but I do honestly like it. It has things about it that I am not crazy about, but like the original You Can't Kiss Me, this song has something about it that makes me enjoy it. Thankfully, I also like the PV for this song... we all know how I felt about the video for the remix of You Can't Kiss Me, so seeing that this PV was going for a totally different look both surprised and eased me. Ah, dagnabbit! Looks like I am stuck with the wide letter-box screen and the filter. ... Oh well, at least it's better than a stark white filter that glares at me. Looking past the filter... damn I love that wig! 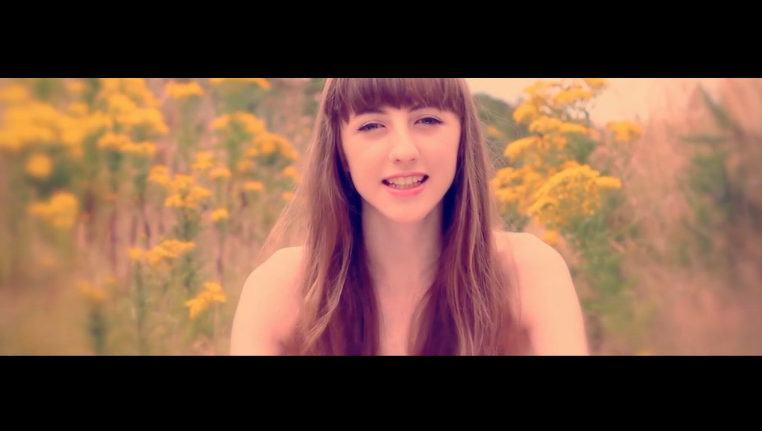 I will even go as far to say that Beckii looks darned good in it! Now, where's a close-up? And wow, her hair is long o-O Guuuurl, gimme some of your locks! Aha! There it is! And damn, that wig suits Miss Cruel seriously well! She actually looks like a character from a game or something, you know, like Kingdom Hearts or another RPG game. 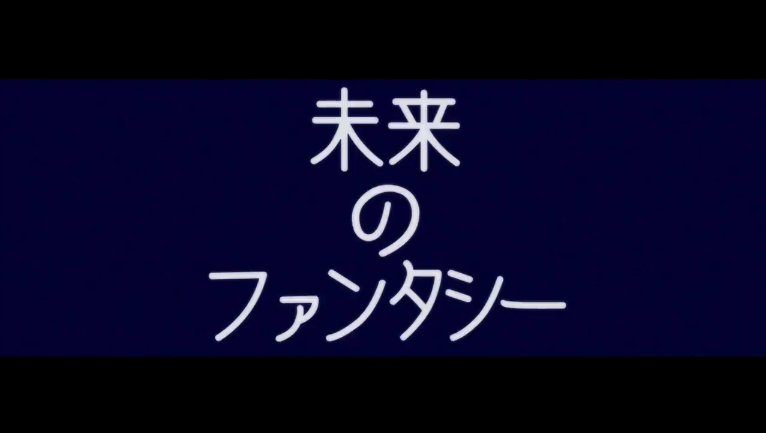 Oh, the title isn't at the very beginning of the PV? Well, that's... different. But okay! I have no idea what street Beckii is walking down, but I want to visit! It looks very toy-like and historical... I like historical! Wait, Miss Cruel, are you on a date!? Oh my! Shock, gasp, horror, squee!!! Who is it? 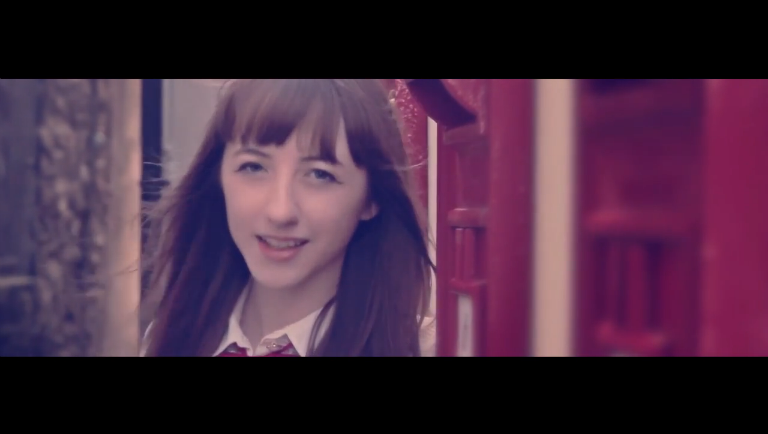 I actually quite like these post-box scenes, and it fits with the letter-box setting we have on the PV, too! Woohoo! Probably one of my favourite locations in the entire PV. 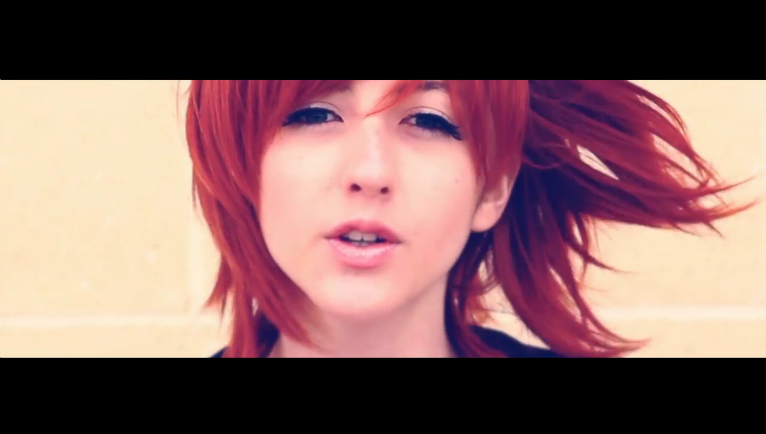 Also, Beckii looks so pretty with her hair like this and the natural look going on! So sweet and fresh! Then again, I like nature-friendly Beckii as well here. She has quite a hippy-ish, free feeling about her that makes me want to run through fields and be one with the flowers... or something. Damn I love that wig! And Beckii seems to be pulling a Gurl, what did you just say? Diva face! Loving it! Miss Cruel won't take no attitude from you! Nuh uh! Also, I love those jeans and that bolero she has... okay, I love the whole outfit. Happy now? Beckii: "But... it's MY wig!!!" 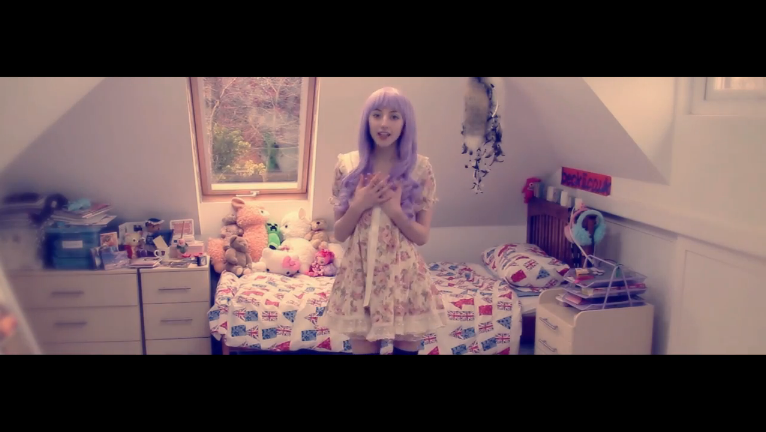 Beckii is surprised by the fact that everyone wants her awesome wig! Shock, surprise, gasp, sacre bleu! 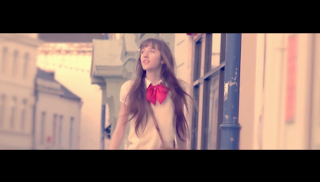 It is scenes like this that bring me back down to Earth from the Idol world and remind me that Beckii Cruel is actually a very naturally pretty girl. Oh, and scenes like this... by the way, what direction is this PV going in, by the way? We seem to switch location a lot. Not that I am complaining, I like the diversity and all, but really... where is it going, or where is it taking me? 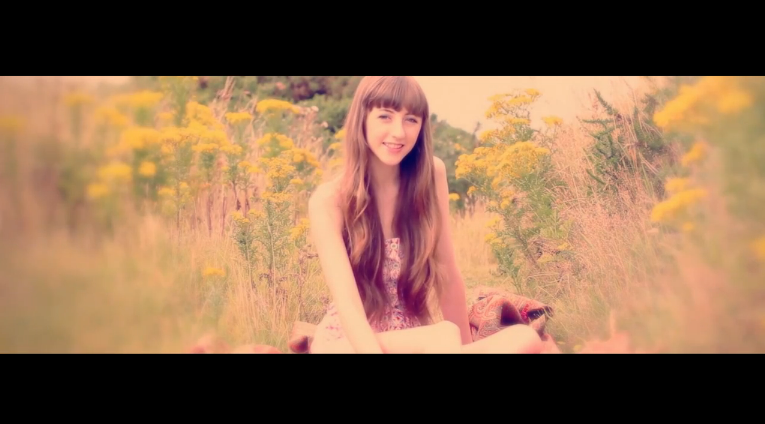 I wish that the tint wasn't here, it kind of darkens Beckii a bit and makes her harder to see. Or the light is hitting the lens and causing the scene to be a little washed out. ... I have to say, this is one of my least favourite scenes in the entire MV. I just don't dig that wig, you guys... but it's all a personal opinion, isn't it? Beckii: "I sure hope this isn't the Three Bears' house..."
I have to say, whilst this PV seems to be shot in random locations, there are some beautiful spots that have been picked for a picturesque, scenic look in this video. Beckii: "... Wait, what if this is the Candy Witches house? No... the house would be covered in candy if it was... hm..."
Beckii: "... I don't think anyone's in..."
I just told you that! Beckii: "You did? Oh... Welp! Sayonara!" 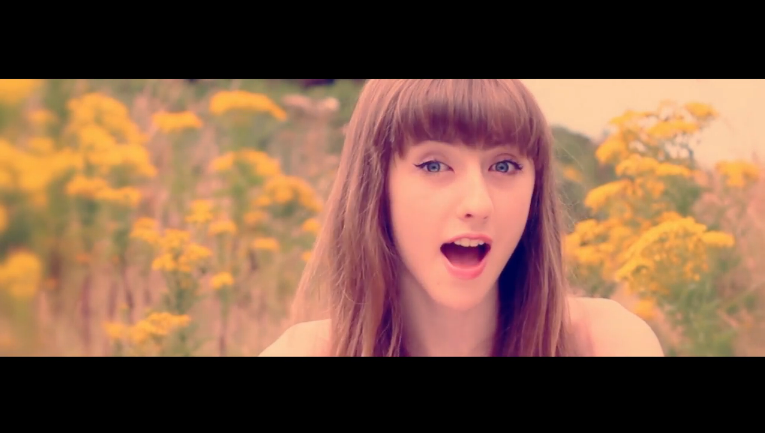 Beckii: "Hahaha, I'm kidding! Why would I leave?" I actually really over these shots, next to the ones shot at the sea cliffs. I feel that this scene is just nicely put together, in all honesty. ... Oh, I forgot to mention, the shots on this scene pan up and down, which gives diversity and all, but it actually looks really great! 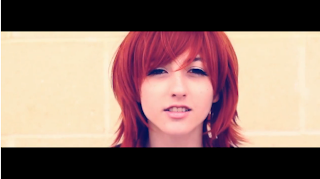 I find it weird how Beckii can switch from being so cute and sweet looking to sassy and full of attitude the next by means of just a red wig! Amazing! 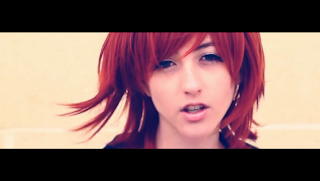 I think Beckii means business in this nicely done high-angled shot! You do not want to mess with her! Beckii: "... Urgh. Too many fangirls." I think that I will call this version of Beckii Beckiikemen, because really... she looks very cool and boyish in a way here, and it suits her! So hi there, Beckiikemen! Oh look, we are back to the sweet and gentle Beckii who is as calm as the ocean waves on a nice day. Just don't annoy her, or those waves will crash into you. You have been warned! Beckiikemen has returned! Seriously, I could see her riding a motorbike and pulling a few stunts to show off. Also, if it weren't for the cute bolero she has, I would mistake her for a guy... just replace the jacket she has with a leather one! ... Wait, what? This is actually pretty random... What happened to Beckiikemen? Yes, kitty, you are adorable (I wish I had a cat...) but your appearance is just too random for words... really, what made you sneak into the editing studio to add yourself in, aye? Oh wait, we're back on track! Hi Beckii!!! Beckii: "... Do I know you?" 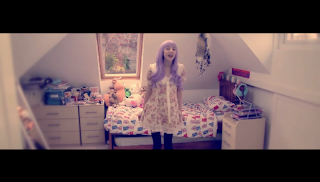 Beckii: "Hey... Can I show my purple wig again!?" Given that I hesitate to include the wig in my screencap... fine, just for now. But really, this is the last time! I do, however, love your dress that you are wearing, Beckii!!! Oh my gosh, it is Beckiikemen! YAY!!!!! Hi, Beckiikemen! Seriously though, even if the dance isn't anything special from what I can see, I do love these scenes. Beckii: "Haters to the left..."
It looks like Beckii saw something she did not like, or she is rolling her eyes. I prefer to think that she is doing the latter. And smile! See, it wasn't that bad now, was it? Admit it, you enjoyed these screen caps quite a bit, didn't you? With the screen captions all done and dusted, this can only mean one thing... review time! And hopefully, you won't all have run away from me by now. You better still be here! Now, I will admit that when I originally saw the thumbnail for this PV on youtube, I was ready to head into the music video for Future Fantasy with a negative approach, thinking that I would not like the video or even dream of giving it a positive review. However, as luck would have it, my sister messaged me on facebook with the hope that I was unaware of the PV and documentary by Beckii Cruel, and explained that the video was pretty and very well done. I trust my sister whole-heartedly when she tells me something like that, because we generally share the same tastes, so I actually went into the video with a more positive outlook, and quite a lot of anticipation to see what the music video was like for Future Fantasy. The video is, in my opinion, visually stunning. There is a lot of landscape and scenery that we can focus on, ranging from a sea crashing against rocky cliffs, a field of flowers and an airy sea landscape, as well as a few scenes set inside and some based in a small, historical looking town. There is a lot of diversity in this video, and whilst we may not be given a clear direction of what is going on in the video other than a performance and the sight of so many beautiful places that Beckii is visiting, the video feels almost like a journey that we are taking on with Beckii. We see her walking around in some scenes, as if she is looking for something, and we are accompanying her as she looks and takes everything in. Of course we have the obligatory solo shots as well where Beckii interacts with the camera as she lip-syncs to the song, but they are just as pretty as the scenes where we see her take everything in. 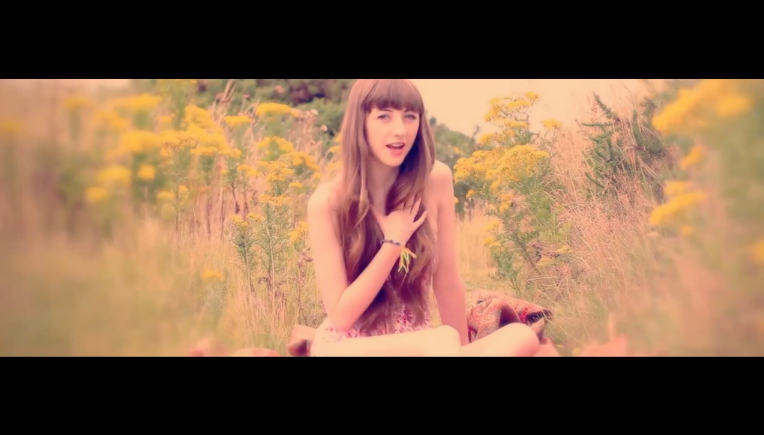 In fact, I think that all of this music video is pretty. My only problems with the video, and this is a personal opinion and just what I don't like about music videos if they have them, have to do with the letter-box effect used to frame the video, and the filter used. I love natural-looking videos. Blue skies, green grass, wind blowing through someone's hair, that is all appealing to me, and I love seeing a music video use nature to its advantage; it is why I loved AAA's Love is in the Air so much, because it used the mountains and blue sky to its advantage, keeping everything simple, crisp and rich in natural colour. If Beckii Cruel's music video for Future Fantasy included all the natural elements, and did not have the filter, I have a feeling I would be in love with this music video. That said, I don't think that the filter totally takes away from the video - it is noticeable, and I have a feeling it was used to keep the balance of the light in each scene equal, but it does not take away from how visually lovely the video is, but I do wish I had seen natural colour in the video, and not through a sepia-tinted lens, so to speak. There is another thing about the video which I found a bit weird, but it is more about how random it is than how much I dislike it (because I don't dislike it at all), and that has to be the scene where Beckii's cat makes an appearance. I really wonder why the cat was included, other than to look cute and to show off the cutie, but I did, and still do, wonder why that scene has been included. 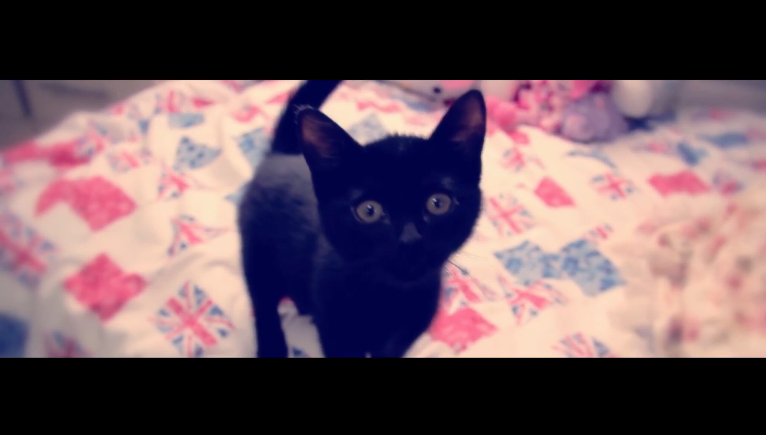 Either way, the scene is there, and whilst it is a random addition to the music video, the cat is adorable! 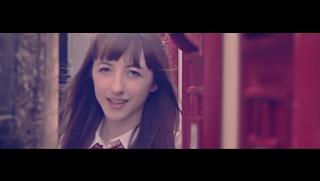 Regardless of the random cat cameo, the filter and the letter-box effect though, I do like the video a lot. It has been filmed beautifully, the locations are wonderful and the editing is great. There is a perfect pace to the video, and it has a lot of diversity within the edit to keep the viewer interested when they watch it. 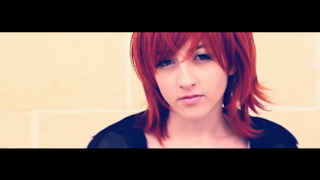 Now, taking a look at Beckii Cruel herself as a performer in this video, I think that she did a pretty good job. She seems pretty comfortable performing in front of the camera, however I noticed, and a few have pointed this out as well on another site, the lip-syncing here is overly obvious and looks very unnatural at times. Then again, Beckii is singing in Japanese, which is never really easy to begin with when you try to lip-sync in any language that is not your mother tongue, and I can imagine how difficult it can be to try and remember the words whilst lip-syncing them as you perform, too. Also, it takes practice, and Beckii has not sung in Japanese for a while either, so it is pretty understandable, really. 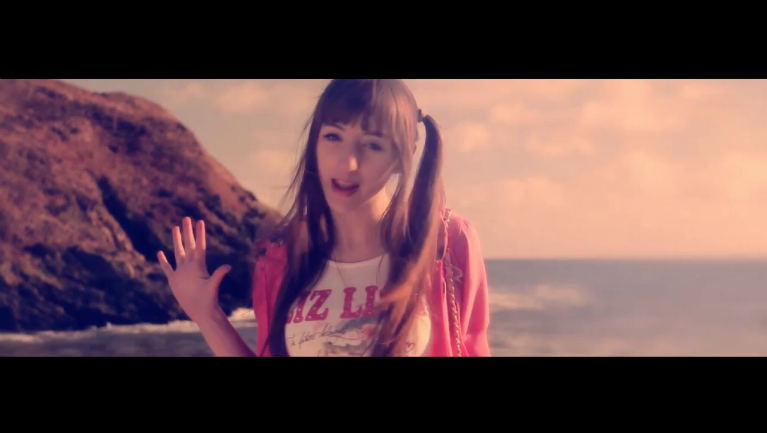 Another aspect of her performance in this video that I saw, and quite liked, was the dancing. Now, the dancing in this looks very minimalistic and simple, but regardless of how little we see Beckii Cruel dance, I think that she had an air of confidence around her in the dance shot that really made me enjoy those scenes where we see her perform on the pier. 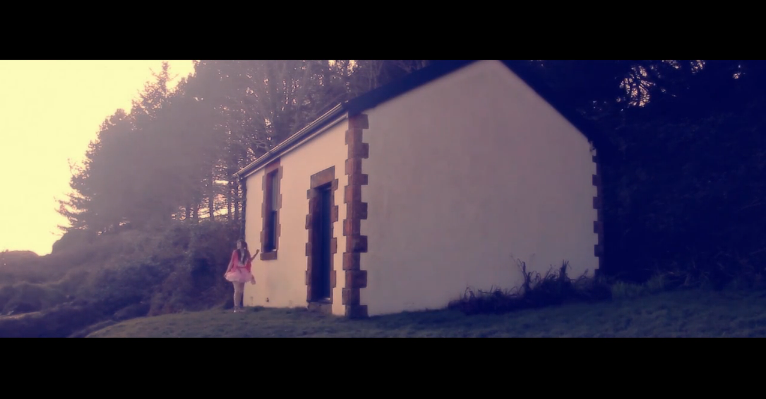 Sure, there wasn't much to the dance, but it worked well enough for the music video, and Beckii looked good doing it. Or maybe that's just me who thinks that way, who knows? All said and done, I like the music video. But what about the song? Well, yeah, I like the song. It is probably Beckii Cruel's best song since her debut. My only issue with it is the harmonies and high notes. I admit, the first time those harmonies kicked in, I screamed because I did not expect it. The rest of the song is fine, but I don't think that Beckii can hit the high notes well enough yet (yet). Now, I am not one to talk, I know; I can't sing, but from all past singles of Beckii Cruel that I have heard, I have never really cared for her voice when she tries to hit the high notes (it is why I didn't like the song Tokyo Love) but honestly, she has become a lot better at controlling her voice, and she has a softer, nicer sound to her vocals which I find quite pleasing to the ears. At times I do think that she sounds like she is talking, but that adds a charm and quirk to the song that appeals to me. Does that mean that I think that Beckii Cruel is the best singer? No, but I think that she has vastly improved from how she sounded a few years back when she first debuted in Japan with Danjo. 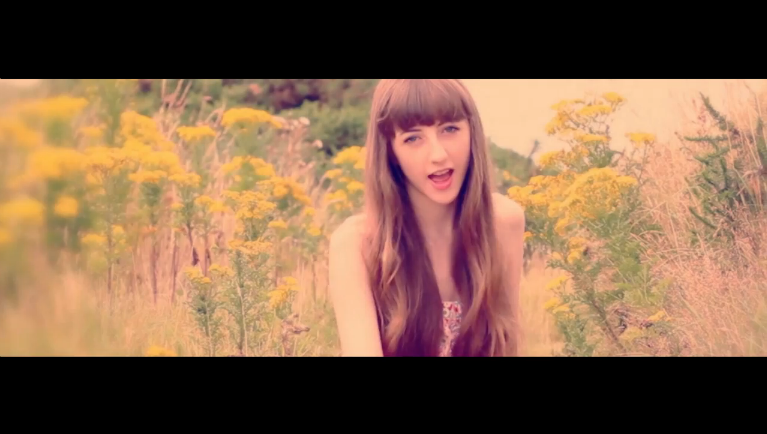 I do quite like her voice like this, just not when the harmonies or high notes kick in, is all. 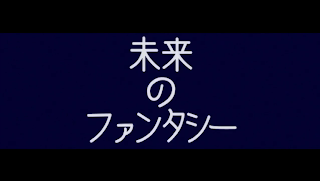 I guess another thing to nit-pick at about this song is Japanese pronunciation, and honestly I am only bringing this up because it has been posted on all the other sites where I have seen the updates regarding Beckii's documentary and PV release. The thing is, I don't really mind that Beckii's Japanese pronunciation isn't perfect. 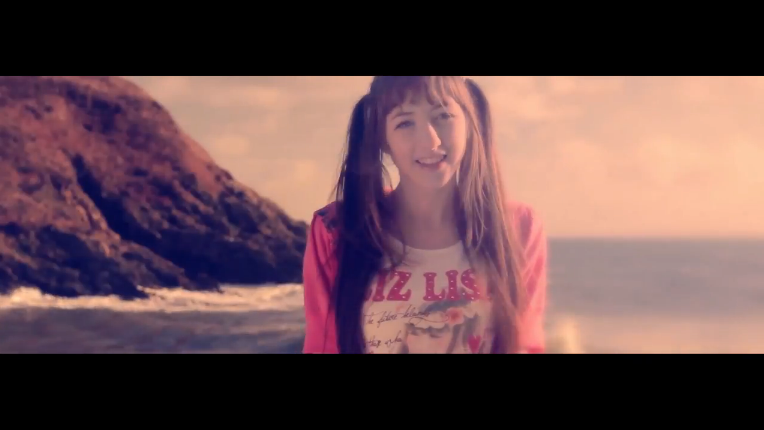 Kind of like how she talk-sings sometimes, I find her pronunciation quite cute and quirky rather than a hindrance. Yes, I know, a lot of you will not like this because a song should be pronounced correctly, and I understand that, but I have always liked hearing that added twang of an accent or slur to the Japanese language that only foreigners can bring. Why do you think I love Weather Girls? I also found it adorable when Lee, formerly of Love-La-Doll, talked because she had that cute Chinese accent whilst speaking in Japanese. It's the same here with Beckii Cruel; her accent and pronunciation of the Japanese language may not be amazing, but I really don't mind it. Overall, I think that Future Fantasy is a nice return single for Beckii Cruel as she returns to the Internet Idol scene. I don't think that this is the best single she could have brought out, because the song sounds quite cheesy in some parts, but I like the overall sound and tone of it, and I do think that Beckii has created a nice single for her comeback. Could she have done something stronger? Possibly, but I think that this is a decent enough song, and her fans seem to really enjoy it, and why wouldn't they? It is a very sweet song that is cute and quite Beckii-like in many ways. It fits her nicely enough (aside from the high notes and harmonies... Okay, I'll stop bringing that up now) and the video is beautifully filmed and edited, and together it is a very nice combination. I like it, I didn't expect to, but I have found myself listening to Future Fantasy more and more since I first listened to it. It is addictive, just like You Can't Kiss Me was when I first heard it, and it is just a very nice song to listen to... or at least it is to me. What are your opinions on it, as fans or non-fans of Beckii Cruel? Also, to those who fear I have abandoned my Japanese Idols, have no fear... I am just on a Beckii Cruel high right now. Go figure, aye? So, what is your Future Fantasy? Hopefully it isn't a Cruel one! I actually REALLY liked this music video! I don't consider myself a big Cruel fan (she's really cute, and an okay singer, but I don't really like her dancing), but lately I have been really interested in non-Japanese idols, because I really hate when people just automatically assume they're not going to be any good because they're not Japanese. Like not being Asian somehow automatically makes you weeaboo. My biggest complaint would have to be that I think the video started out with too many scenes. You know how some videos start out with like one or two scenes, and then add a few as they go along, and end it with an epic mash-up of all of them? Well here we just kinda saw them all at once and it was a bit overwhelming. YAY! So I am not the only mad person on this planet who enjoys it, whilst still not being a big Cruel fan, either? And I udnerstand what you mean, I am also currently interested in non-Japanese Idols. It's strange for me haha. And aha, I remember when I was accused of being a weeaboo a lot for liking Anime! I am glad someone is a fan of wide screen effect, but it still does not appeal to me! But, I do see what you mean about that Fantasy feel to it! The filters add that touch of fairytale-like quality, too, which is nice, but I am weird... I just don't care for filters! Looking at it now, the scenes are pretty clustered, aren't they? But I dunno, I liked it in a way. I thought the scenes showed us a journey or something along those lines, and made it look like she was experiencing new things in a town she had never been before. Oooh, I never picked up on her pronunciation for Fantasy. That's pretty interesting! 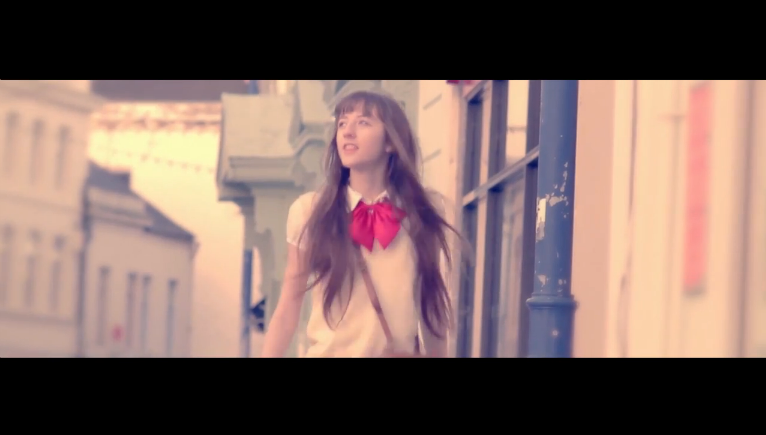 I think it is all well done, I like this PV and the song is lovely, too. Beckii is getting better with performing on camera, but all together, it is indeed very beautiful and wonderful to watch.